Did the Catholic Church Squash the mystics (who were mostly women)? ... by harassing and/or condemning many of my favorite mystics, like Master Eckhart, Angela of Foligno, the "Spirituals", i.e. the more strictly poor branch of the Franciscans in the 14th century, Marguerite Porete, etc. It persecuted the Beguines, a mystical movement of mostly lay women. Many of our greatest Saints were women mystics. However, none of them are mentioned in the above email. We will examine each of these groups and people that were referenced in the above email. We think those are very wise words from a great mystic, something for all of us to consider. His humility matched his greatness and his love for the doctrine is clear. The Pope listed 28 errors drawn from his writings but that does not negate his contribution to theology. There are not many great men who are right about everything they say. Einstein made mistakes, but that didn't limit his greatness. Eckhart lived to 67 years of age which was pretty long back then and it appears he had a natural death. In looking into the life of Angela of Foligno, we see no evidence that she was tried before the inquisition; we've read a dozen synopsis of her life from Catholic, secular, and Gnostic sources, but no mention of a traumatic incident before the inquisition. We're not saying it didn't happen but we would think if it was a significant hindrance to her spiritual path there would be some mention of it. It appears she died a full member of the Catholic faith surrounded by students and followers. So although we totally agree that it was completely wrong for the inquisition to hand her (or anyone else) over to the secular authorities, there is little doubt that her theology was anti-Catholic. It was not a good time in history to be angry with authority and to be in their face about it, especially if the theology was clearly incongruent with the Early Church fathers (& mothers). Today it is much easier to hate the Church publicly but We have to bear in mind that the Church believed that eternal damnation was waiting for the heretic and that anyone the heretic taught would also be risking damnation also. It was also not a good time in the history to be switching to the Muslim faith while claiming to be Catholic. The Muslims were looking to invade Europe. "In its essential features Quietism is a characteristic of the religions of India. Both Pantheistic Brahmanism and Buddhism aim at a sort of self-annihilation, a state of indifference in which the soul enjoys an imperturbable tranquillity. And the means of bringing this about is the recognition of one's identity with Brahma, the all-god, or, for the Buddhist, the quenching of desire and the consequent attainment of Nirvana, incompletely in the present life, but completely after death. Among the Greeks the Quietistic tendency is represented by the Stoics. Along with Pantheism, which characterizes their theory of the world, they present in their apatheia an ideal which recalls the indifference aimed at by the Oriental mystics. The wise man is he who has become independent and free from all desire." .especially from his "Dux spiritualis" (Rome, 1675), sixty-eight propositions were extracted and condemned by Innocent XI in 1687 (Denzinger-Bannwart, 1221 sqq.). No preparation is required before Communion nor thanksgiving after other than that the soul remain in its usual state of passive resignation; and the soul must not endeavour to arouse in itself feelings of devotion. Interior souls resign themselves, in silence, to God; and the more thorough their resignation the more do they realize that they are unable to recite even the "Hail Mary". They should elicit no acts of love for the Blessed Virgin or the saints or the Humanity of Christ, because, as these are all sensible objects, love for them is also sensible. External works are not necessary to sanctification, and penitential works, i.e. voluntary mortification should be cast off as a grievous and useless burden (32-40). God permits the demon to use "violence" with certain perfect souls even to the point of making them perform carnal actions either alone or with other persons. When these onsets occur, one must make no effort but let the demon have his way. Scruples and doubts must be set aside. In particular, these things are not to be mentioned in confession, because by not confessing them the soul overcomes the demon, acquires a "treasure of peace", and attains to closer union with God (41-52). The "inward way" has nothing to do with confession, confessors, cases of conscience, theology, or philosophy. We do not hold with modern feminism that the Church is/was just trying to squash the interior mystical experience by forcing external doctrines down the throat of mystics in order to impose a male dominated model on society. We believe the theology of the Catholic Church is of God and that that is the fruition of Jesus' promises to Peter (Mat 16:18) and is dogmatically infallible, even though Church people are not perfect. It appears that the affinity for these mystics is leading the woman who wrote the email above on a path that is pretty close to Quietism, and perhaps there is very little we can say to make her think that we understand the interior mystical experience. I (Hugh) followed the path of my mystic teacher Swami Satchidananda of Integral Yoga. I was daily devoted to him for 4 years. I fasted 3-6 days, many times in total meditation and breathing practices. I arose each morning with Hatha Yoga, Pranayama, and meditation followed by chanting. I studied the fusion of the 5 elements with Master Mantak Chia who mastered his art through the monks of the Shaolin Temple (made famous by the 1970's TV series Kung Fu). I spent a year with him. At one point I was doing the "Microcosmic Orbit", "Chi Kung", "13 move temple style Tai Chi", and the "Fusion of the Five elements" meditations 6 hours a day. I studied "Nichiren Shoshu Japanese Buddhism" and had a "Gohozen" altar in my room where I meditated every day. One night, during a meditation, I was opening up Chakras, which are spiritual channels. I was wide open. I began to feel a thickness in the air. An eerie feeling came over me. I was not alone. It came closer. It surrounded me. Then I realized that I was being surrounded by many disturbed "entities." I could feel them all around me - dozens of them. I tried to shake them away but they came closer. There was a slimy feeling to it all, yet at the same time I had a sick attraction to it - I was giving in! I believe this was the moment Satan was waiting for. The protection of God was waning because I had drifted away from it. These spirits were descending on me. I limply said "someone help me." Yet at the same time I was giving them permission even though I didn't want to give in. I could feel them starting to take control (Mat 12:45). It was like nothing I'd ever experienced before in my life. I did not follow up this experience of Jesus. I did not join a Church. I did not join a Christian community of believers. I tried to go it alone in this spiritual journey. This was a big mistake. In time, the allure of the New Age came back. (Mat 21:12) I began to think I could mix Jesus with the New Age (like oil and water). A famous Guru that I had seen in New York was going to be in Montreal. I decided I wanted to completely devote myself to him. I went to Montreal to meet him. I was to be given a new name. I was going to abandon everything to become a Sanyasin and move to a little cult town in Virginia called "Yogaville." I took the bus to Montreal. In Montreal, I lost my way and got off the bus. I looked up and saw a huge Church. 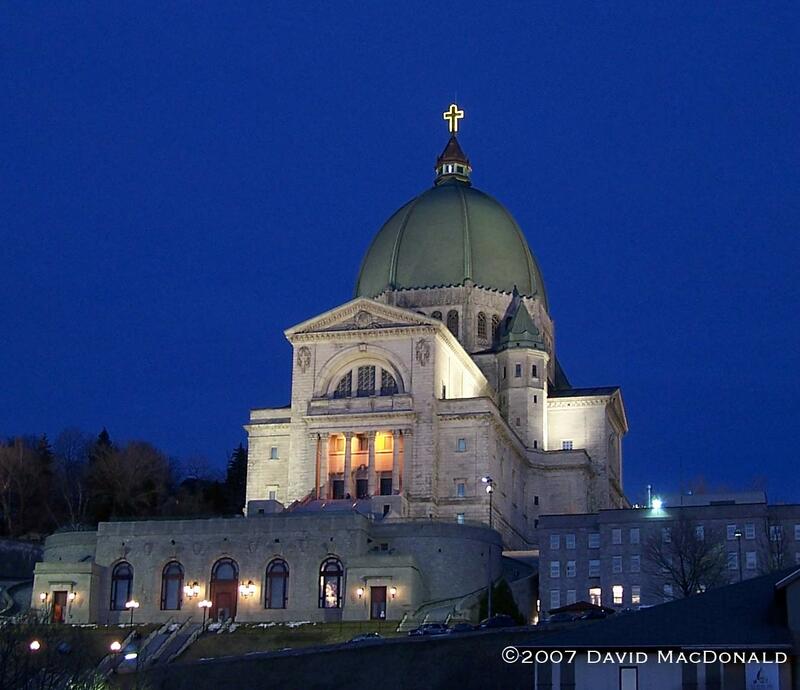 It was Saint Joseph's Oratory (in the picture). I was struck by its beauty and majesty. I thought to myself, "I'll just go in here for a few minutes before I try to find my way and meet the Guru." I walked into the Church and saw elderly women whispering prayers with their heads bowed. I was very moved and said to myself ,"these women have faith! Maybe there is something here for me. Maybe the Church isn't a cold stone building full of hypocrites" - which was the New Age spiritual pride that I had before that moment. "Lord Jesus, I don't know you at all, but here I am, thinking of changing my name, of leaving my home, and joining a cult. Could you please come into my life? Take my heart, take my health, take my circumstances, take everything about me. I'm yours!" A peace descended on me. I got up and lost all interest in the Guru and the cult. I was infused with the Holy Spirit. I had no need for the Guru, I had Jesus! I stood up tall and walked out of there a new man - a Christian. This time I realized the importance of belonging to a Church, the importance of Christian fellowship and the importance of a community of Christian believers praying for each other. I learned that there is an absolute moral law. It is even more binding than the law of gravity. It is embodied in the person of Jesus and is written in his Holy Word - the Bible. That was over 20 years ago. Since then, Jesus has been with me each and every day. We think the natural outcome of Quietism is a theology that cannot stand up under scrutiny. We do not think its path can lead us around the insurmountable obstacle of original sin, which, without the rudder of the Church (Jesus directed & nurtured by Mary) and without the sacraments (ministered and protected by the Church) it will quietly and subtly steer us towards a non-Christ centered destiny. Andthat is a very bad place. There are great mystical writings in the Church. i.e, "The Dolorous Passion of Our Lord Jesus Christ" from the Meditations of the Venerable Anne Catherine Emmerich." The book is here. Many of the greatest Saints were mystics. We pray that those who are drawn to mysticism will follow the lead of the Catholic Saints and stay true to the Church yet have an awesome interior life. See also the Vatican position paper on the New Age (opens to a new window).